Mike Kingston is a multi-instrumentalist front man and composer in ‘Bella Cajon‘ , ‘The Wagtails‘, and Phantasticus. He continues to perform regularly throughout Wellington and New Zealand. This entry was posted in Music, New Zealand and tagged acoustic, acoustic guitar, Bella Cajon, cello, folk, gypsy jazz, Mike Kingston, New Zealand jazz, New Zealand music, Phantasticus, The Wagtails, The Winter, Wellington. The debut album by The Winter: instrumental improvisations from Wellington, New Zealand, 2003. 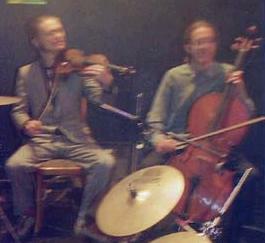 The band emerged fully formed on winter solstice day in June. Builds from acoustic intimacy around the winter fireplace to the electric blizzard climax of ‘Parataxes 9‘. 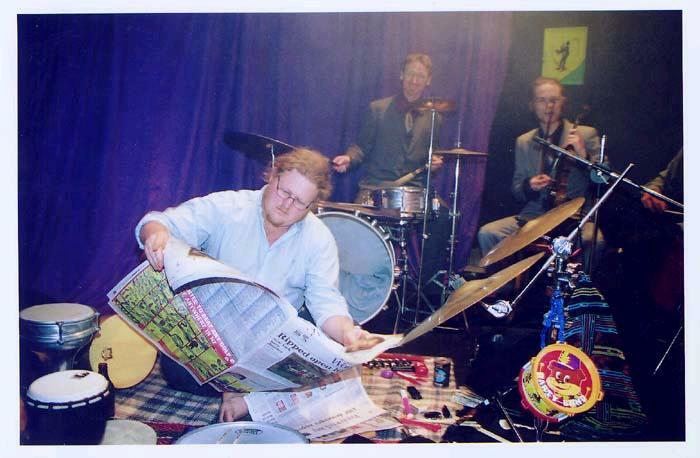 Photos by James Gilberd, from The Winter’s first gig at Photospace Gallery, Wellington NZ, August 2003. This entry was posted in 2003, Free mp3s, Music, New Zealand, The Winter and tagged acoustic, acoustic guitar, avant-garde, cello, Dave Edwards, electric, electric guitar, experimental, fiffdimension, folk, Free improv, Free mp3s, harmonica, improvisation, kiwi, Mike Kingston, music, new zealand, New Zealand music, percussion, Simon Sweetman, The Winter, Wellington.